Universities Allied for Essential Medicines | What does it mean to be neglected? You are here: Home / Chapters / UAEM Groningen / What does it mean to be neglected? 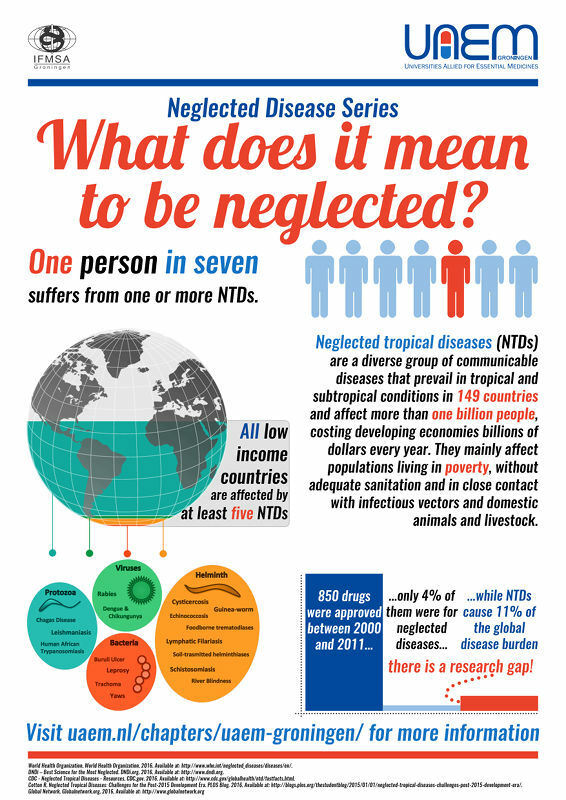 To increase awareness about neglected diseases (NTDs), UAEM Groningen launches the NTD posters series. This is the first, please check back later for more! “The enjoyment of the highest attainable standard of health is one of the fundamental rights of every human being without distinction of race, religion, political belief, economic or social condition.” Already in 1946 the human right to health was written down in the Constitution of the World Health Organization. Little adjustments were made since, but the essence kept standing strong: everyone deserves the best health possible (1). In order to reach a high standard level of health, lots of research has been done to better the patient’s life. Knowledge has broadened, and so many illnesses and its symptoms can be prevented, cured or weakened. However, not each disease gets an equal amount of attention. Especially illnesses in poor countries appear to be neglected.To give these diseases the attention they deserve, the World Health Organization has set up a list of such neglected tropical diseases. These seventeen diseases together are prevalent in 149 counties, affecting more than one billion people and costing the economies billions of dollars each year (2). Ironically, prevention and control are often within reach. Six of the neglected diseases are even concerned ‘tool ready’. This means that powerful and inexpensive tools are available, and implementation strategies are already developed. The only obstacle left is how to reach the people in need (3). The World Health Organization committed itself to overcoming this last obstacle, while turning the leftover ‘tool-deficient’ diseases into ‘tool ready’ diseases. By 2020, at least two neglected diseases should be eliminated (2). The first step in tackling these neglected diseases, is to offer them the attention needed. Therefore this poster series has been set up. Several posters will be made, pointing out the diseases on the World Health Organization’s list. In this way, we can change the ‘neglected diseases’ into ‘diseases’. No patient deserves to be neglected. ‘The Right to Health Fact Sheet No. 31’ by World Health Organization and Office of the United Nations High Commissioner for Human Rights (June 2008).